Thanksgiving is a great time to teach your toddler about being thankful, and it’s especially fun to do it through crafts. You can do this without too much preparation and with basic supplies, which makes it an inexpensive activity as well. Go the extra mile and invite your friends over for a play date and have some mommy time while crafting! 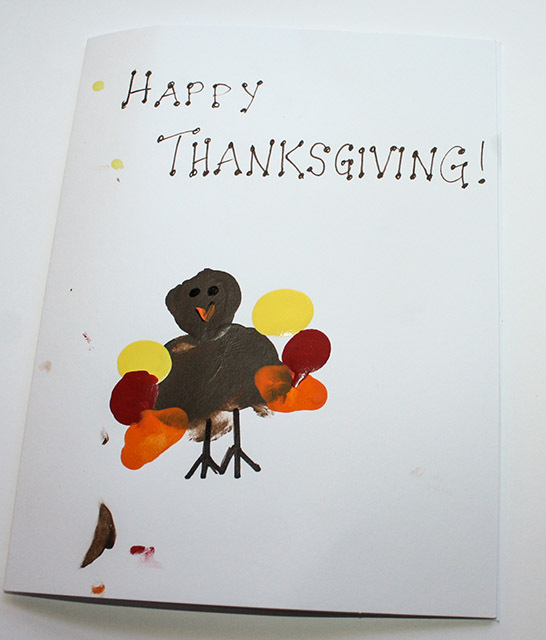 Here are some of our favorite ideas for simple, toddler-approved crafts that teach thankfulness! 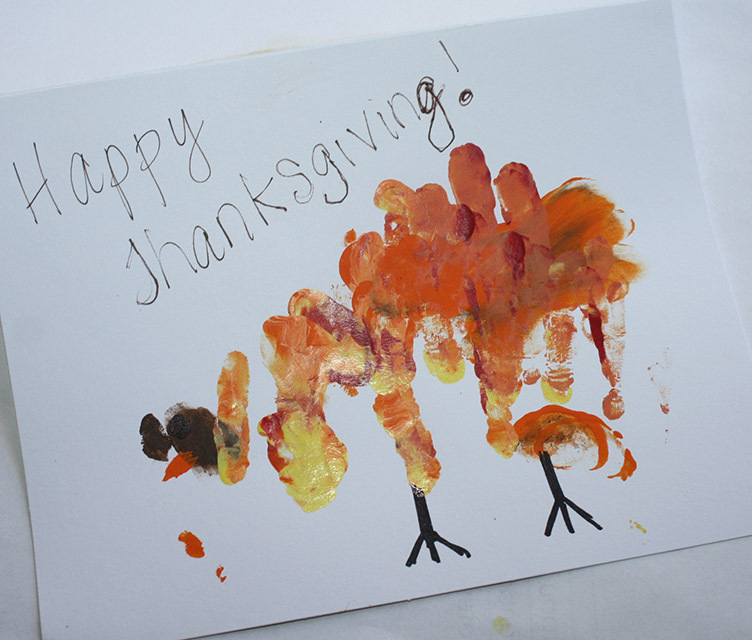 I love this craft that has children make a fingerprint turkey “Thanksgiving card.” The great part about finger painting, (and really most crafts) is the added cognitive benefit. Finger painting helps develop fine motor skills, identify different textures, and even learn new vocabulary. This activity is great for toddlers, preschoolers, or even younger school-aged children. Have your child make one for people they are thankful for. Grandparents, aunts and uncles will love getting this special Thanksgiving card. They also make fun place cards for Thanksgiving dinner. Place your child’s thumb in the brown paint and make a brown body and head. Use the pointer finger to make colored feathers around the edge. Once this has dried, use your black marker to draw the face and feet. Be warned, your toddler may have their own ideas of how to make this, but you can still go with it! My four-year-old did a little better, but we’ll have to work on keeping the card cleaned up. But, it has personality! 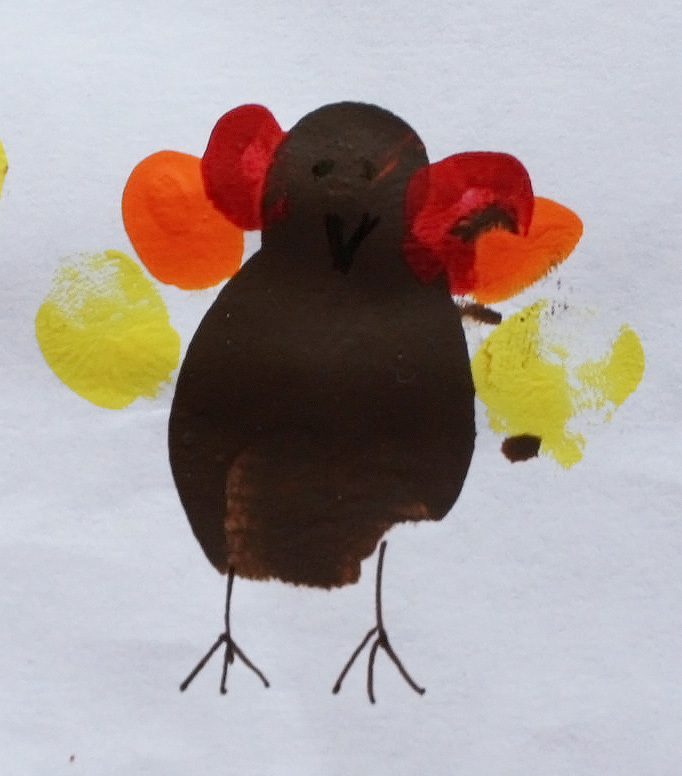 If finger prints are too difficult, they can always use their whole hand print to make a turkey. 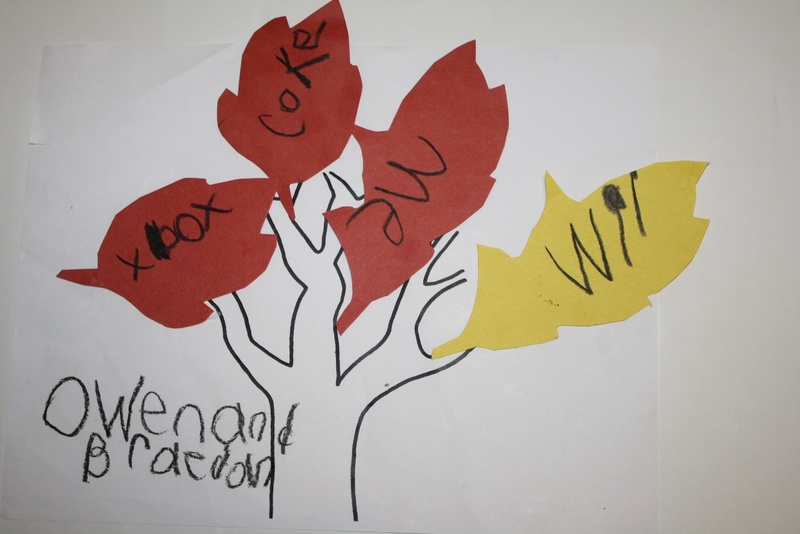 This is a super way to have your children think about what they are thankful for. And it is one of the least difficult crafts to do. It’s good for children of all ages. 1. Draw a tree trunk with branches on a paper. 2. Cut out leaf-shaped pieces of paper. 3. Have the child tell you (or write, if they are able) the things they are thankful for on a leaf. 4. Glue the leaves on the tree. Voila! That’s it. While doing this craft, it is important to talk about gratitude and thankfulness, but be sure not to try to influence the items they are thankful for. If they are thankful for cheerios and Legos, so be it. Or, in my son’s case, Wii, Xbox, and Coke. Maybe I need to spend some time talking about gratitude and thankfulness with him, but at least he listed a friend at the bottom. 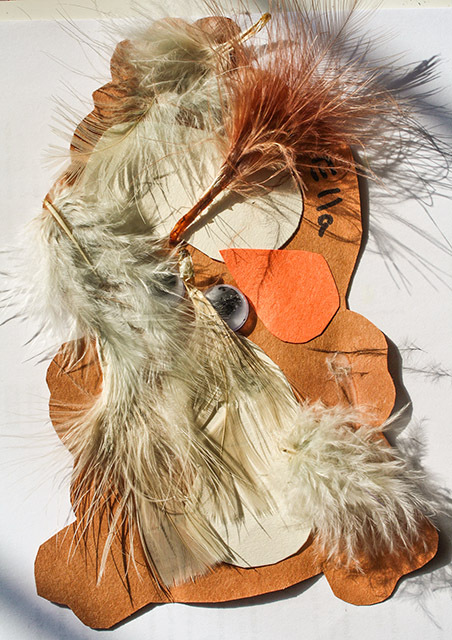 Toddlers love gluing things, so my favorite, easy activity is what I call the “Build Your Own Turkey.” This one is just for fun, but you can incorporate a theme of thankfulness by having them tell you what they are thankful for and writing that on the turkey. Brown, orange, and off-white colored construction paper OR paper plate painted/colored brown. 1. 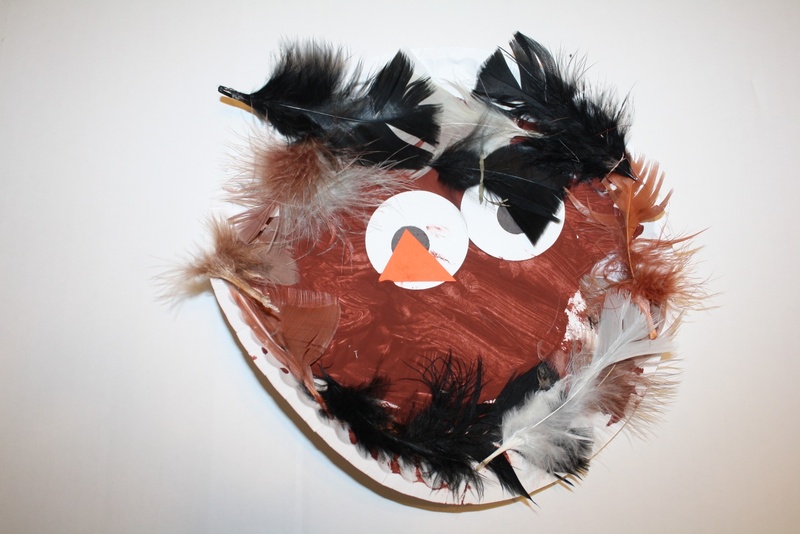 Cut the brown construction paper into something that resembles the shape of a turkey’s body (or for an even simpler task, use a paper plate and allow them to paint or color it brown). It doesn’t have to be perfect. The toddlers don’t care. 2. Cut the orange paper into small ice cream cone shapes for the beak. 3. Cut some kidney bean shaped pieces for the abdomen or wherever they want to put it – from the off white paper. 4. Place the feathers, googly eyes, glue sticks, and body pieces out. Give each child a body piece or plate and let them go from there. 5. It may not result in a perfect turkey, but I assure you, they’ll have fun! We had a blast making these crafts – all of us! My two-year-old, four-year-old, and seven-year-old! As a bonus, we had a chance to really reflect upon the things we are thankful for and make some lovely cards for grandparents and other relatives. What are your favorite activities for teaching gratitude and thankfulness? Tips to Lighten Up Thanksgiving Dinner + Creative Ways to Eat Leftovers!